"Killing us fast and slow." An astounding performance. 5 stars doesn't do Mark Thomas justice. What a guy. The best researched presentation I have the pleasure of in any forum. It is a fact that it was based upon real life, death, compassion and particularly the KILLING effect of endless government privatisation dogma and austerity policies on the NHS. He deserves a medal as do most (not all) of those connected to the NHS that he interviewed or shadowed. Don't miss it. Take tissues. "Informative, passionate, important and funny"
This is Mark Thomas in his purest form; activism with jokes ( as Terry Pratchett once said, funny and serious are not opposites ). If you remember mark from his C4 series, which began as a comedy show with pointed political humour and moved more and more to clever activism laced with humour, you'll know what you're in for here. But this performance is fuelled by passion of a different level. Over the course of 90 minutes Mark recounts his experiences shadowing and interviewing GPs, surgeons, mental health workers, nurses and academics. He viscerally brings to life the power and importance of our National Health Service, how the healthcare we receive is enmeshed into our lives on every level and points up the ways in which it is being dismantled. Throughout, it is genuinely funny - Mark Thomas is a great comedian as well as an activist - and the laughs perfectly underscore the importance of his message. As always, it is a joy to visit the Drama Studio. Simply one of my favourite performance spaces - now with a working bar! Excellent show. Good venue. Enjoyed the evening. 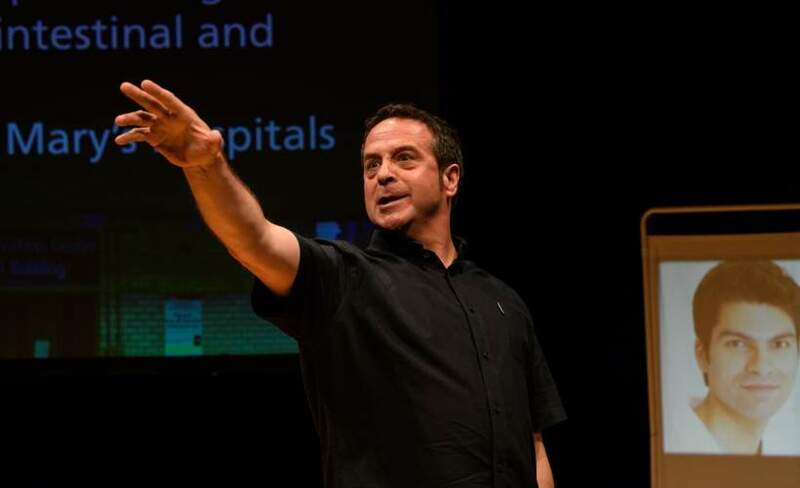 "Mark Thomas -Sheffield University Drama Studio"
Mark Thomas is 54, the NHS is 70, UK national average life expectancy is 84. If Mark makes it to 84 the NHS will be 100, what will they both look like? Based on a series of interviews with leading experts in and on the NHS and residencies in hospitals and surgeries, Thomas working with director Nicolas Kent, uses his own demise to explore the state we’re in. What’s going right, what’s going wrong and how does it get better?